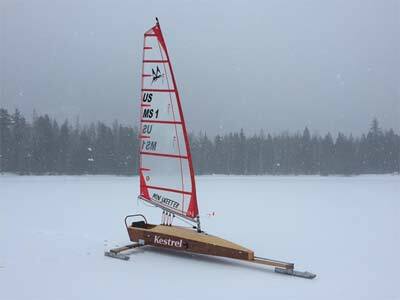 In 2014 I decided to design an iceboat that was small and comfortable to sail. Smaller iceboats are easier to store transport and set up. This allows for more use on smaller plates of ice during the season. The original idea was to build two identical iceboats for a friend and I to sail. The first day I sailed mine I was asked how can one be obtained. I decided to draw plans and make an 8 part you tube building tutorial for the Mini Skeeter. Afterward I was approached by others wanting a landsailing version. So I designed additional components that bolt on to allow the iceboat to be a landsailer. I also designed a larger fuselage for bigger people. The Plans consist of over 60 pages of pictures, cut sheets, drawings and a liability release for the designer. It includes the original fuselage, the large fuselage, the iceboat version and the landsailer version. I list various vendors for the parts (sail, rigging, wheels and ice runners etc.). The fuselage is made from ¼” and 3/8” plywood with a strip planked deck. The fuselage is 10’ long with a wheel (land) or spring board (ice) extension and the width is around 8’. The un-stayed aluminum mast is also included in the plan and is 17’ tall. 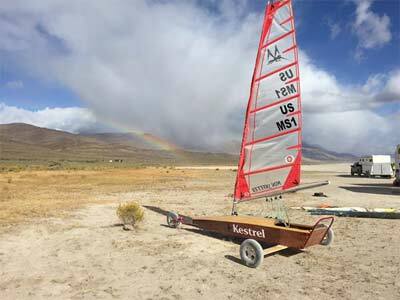 The sail package includes a 5.5m for light wind and a 4.0m for heavier winds. We are usually on the playa or ice longer than the other boats due to the sailing/wind range of the Mini Skeeter. They are about as much fun to build as they are to sail. We have a nice sized one design fleet that competes annually at the Land Sailing Americas Cup every March. Over 80 Mini Skeeter sail numbers have been registered all over the world in the last three years. Top speeds recorded so far are 69 mph on land and 64 mph on ice.